A rendering from Metro of possible improvements to the Willowbrooks/Rosa Parks Station. Metro is developing plans to improve Willowbrook/Rosa Parks Station where the Blue and Green lines meet. The public is invited to attend a public hearing to provide comments on the Draft Initial Study for the Station Improvement Project. In 2011, the Metro Board of Directors adopted the Rosa Parks Station Master Plan for this busy transfer station. This project implements that plan and includes enhancements to pedestrian flow, lighting and safety. 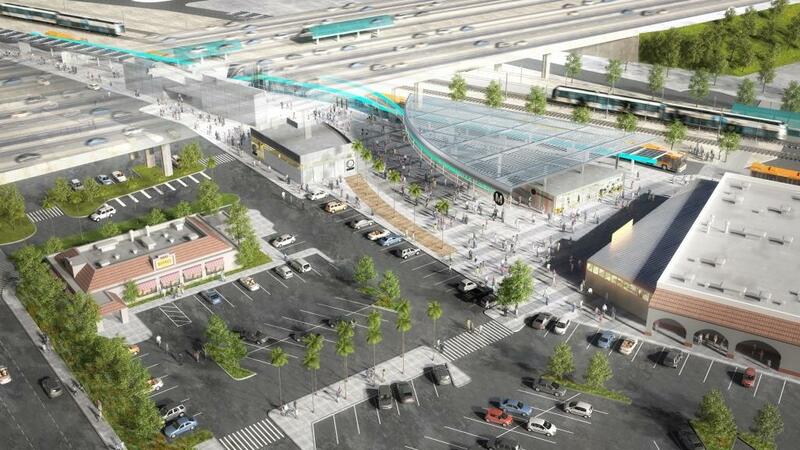 The project will also improve transfers at the station and create better connections to nearby destinations, including the adjacent Kenneth Hahn Plaza shopping center. The Draft Initial Study has been prepared to determine if the project will have any environmental impacts and is currently available for public review. An electronic copy of the Draft Initial Study is posted below. The deadline for written comments is 5 p.m. on Monday, June 8. I am glad to hear this because the Rosa Parks Station has unfortunately looked like a dump for years. One improvement that I think that needs to be made is to put in more escalators now that I am a disabled senior the stairs are too difficult for me. And when you go from the Green Line platform to the Blue Line platform you have to change elevators. The current set up is just a big mish mash. I totally agree with you Rick. Good point. Only Metro would create a rendering of the new design with more parking lots and make it look like a strip mall! Yes, let’s continue to waste valuable land space in LA with free parking designs. Here’s a good idea: solve first mile/last mile at the same time by building a multi-use condo/shopping mall next to it. WITHOUT PARKING SPACES! This does not look anything like what was first presented to the community of Willowbrook. New stores, new parking lot. Better pedestrian access. However, anything than what we have is better than nothing. While I share the sentiment that it’s more parking lots but with better retail stores, it is a start on Metro becoming more of a real estate developer than just being a transit provider. There’s a reason why mass transit companies in Asia acts both as transit operators and real estate developers and are so independent and profitable rather than being reliant on taxes to keep them afloat. For example, look to Japan’s Shinjuku Station, which holds the Guiness World Record of the world’s busiest train station with over 3.64 MILLION passengers PER DAY (http://www.guinnessworldrecords.jp/world-records/busiest-station). Shinjuku Station is a major hub used by 5 train operators and 11 lines, 36 platforms, 200 exits, bus and taxi terminals, underground shopping malls, department stores, residential and commercial high-rise properties. What they don’t have are wasteful uses of land space to parking lots! That’s the direction you guys need to be heading toward. Full integration of the train station with residential and commercial properties and “lead by example” on how LA needs to re-imagine itself from a “drive your car and park there” type of station to a full grown hub of residential and commercial activity that integrates itself to rail operations. As stated above, if Metro has a problem with “first mile/last mile” issues, said issues can be resolved by erecting massive high rise residential structures right next to the station itself. If people live right near the station that is accessible by walking less than 500 meters from the station, then you negate the need of wasting land space for parking lots and get rid of this whole wasteful “park-and-ride” concept. The larger the property and taller the buildings, the more long term revenue Metro can make than just wasting it on parking spaces and single story strip malls. If LA is to be sustainable for the next 100 years, it needs to wake up from from their hatred of high density and start facing the reality that the only way forward is start building more structures upwards. Metro could also start its own credit union or financial institution to offer home loans to prospective buyers of Metro developed condo properties and provide small business loans to retailers and merchants that wishes to conduct business at Metro owned properties. That’s another way Metro can earn extra revenue: through interest on home and small business loans. Metro going into the financial sector would also greatly enhance TAP benefits and start providing financial services to the unbanked who fall prey to payday lenders and check cashing services. It’s really a no brainer that Bank of America is a lot more profitable business to be in than running public transit.